This month a long time friend graduated with a PhD in science after 7 years of rather difficult studies beyond his master's degree. It was a big relief to him ending a period of weekend laboratories and late night study sessions. He passed the oral exams two months ago, and was left with only a few loose ends to tie up. Two pages of his dissertation had top margins that were a quarter inch too wide. Remembering my own 23 years of college and some similar experiences along the way, I sent congratulations and included a copy of Albert Einstein's Ph.D. dissertation, with the hope that it would help to get the margins right. Albert Einstein’s dissertation fee in 1905 was 230 Swiss francs, but I believe those were silver francs, so the true value in today's currency was about five grand. Einstein produced a hand written manuscript, but did not preserve it for posterity. Zurich University did manage to keep the printed version, and now makes it available to the world as a PDF file, at least for the German speakers. 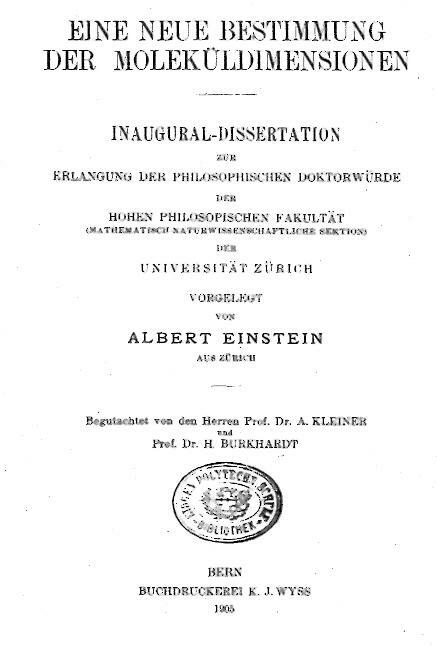 Einstein's Ph.D. dissertation was printed in Bern 30 April 1905. In 24 pages of calculations and text Einstein's estimate of Avogadro's number came out wrong by a factor of nearly 3, but good enough for a PhD degree in Mathematical Physics from Zurich University. There is a new method developed in the dissertation that gives lasting value to the work. Einstein also published a hand full of other original papers about the same time with help from his friends, some of whom he remembered long enough to mention in later years. Otherwise Einstein did not attend graduate school, or participate in seminars, or attend lectures, or do research. He got his graduate education from reading magazines and talking with friends in his spare time. Realizing that the answer in his dissertation was wrong, Einstein made a correction for a magazine article the following year, after receiving help from Paul Drude the editor of Annalen der Physik. The difference was explained as a better set of data that had become available. After 18 pages of mathematics Einstein produced an estimate of Avogadro's number wrong by a factor of nearly 1.5 on the second attempt. A few years later Einstein’s estimate was found to be wrong in experimental work with chemical reactions, so a friend helped Einstein make another correction. That’s not bad for a third attempt. Now there are other ways to derive Avogadro’s number giving the present value. Einstein's experience gives encouragement to all of those hard working graduate students who labor for years under a crushing load and are finally expected to produce a dissertation book of 300 to 500 immaculate pages in which all the margins are exactly right. Remember it helps to keep trying. Einstein's first dissertation from 1901 was rejected as the work of a crackpot, but the university allowed him to recover his fee. Also remember it is nice to get help from friends who know how to do math.